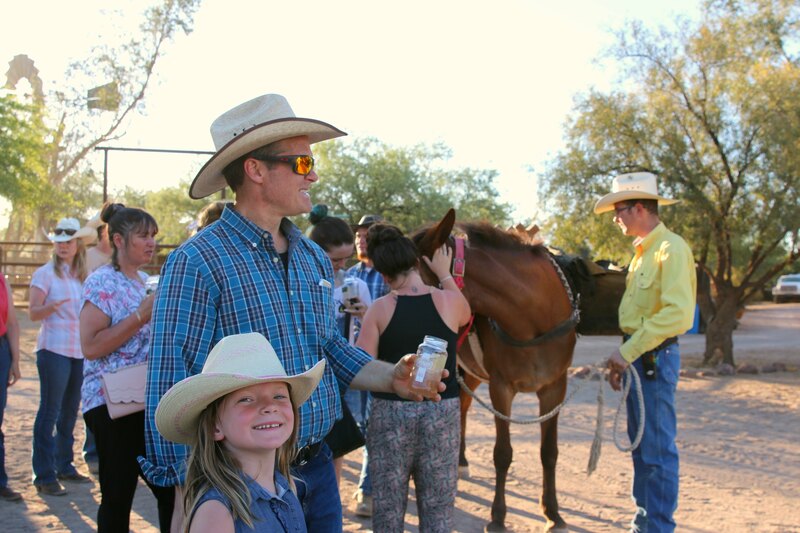 Family Dude Ranch Review: White Stallion Tucson Arizona – It's a Lovely Life! 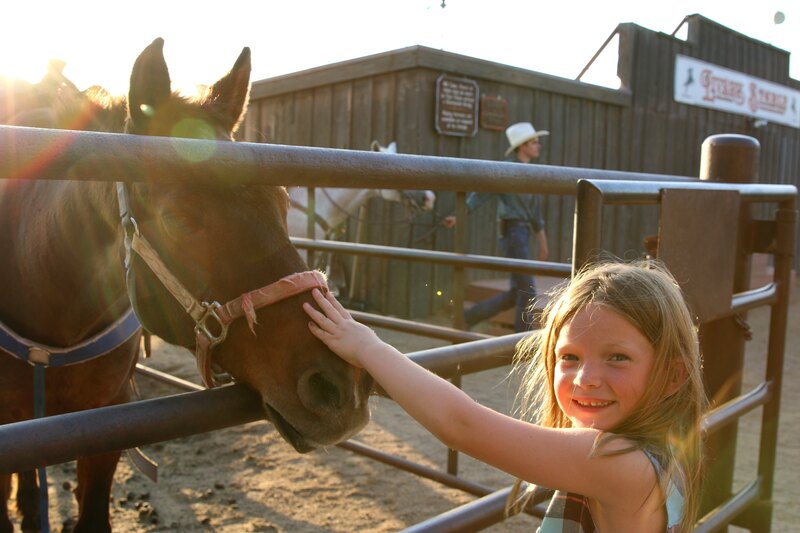 As a child, some of my favorite summer memories were going to a horse camp. We would go for a week at a time, just us kids, and have the time of our lives! Riding all day, learning about horsemanship, and just having fun. I knew this was something that I wanted my own children to enjoy, but I also thought it would make a great family adventure! 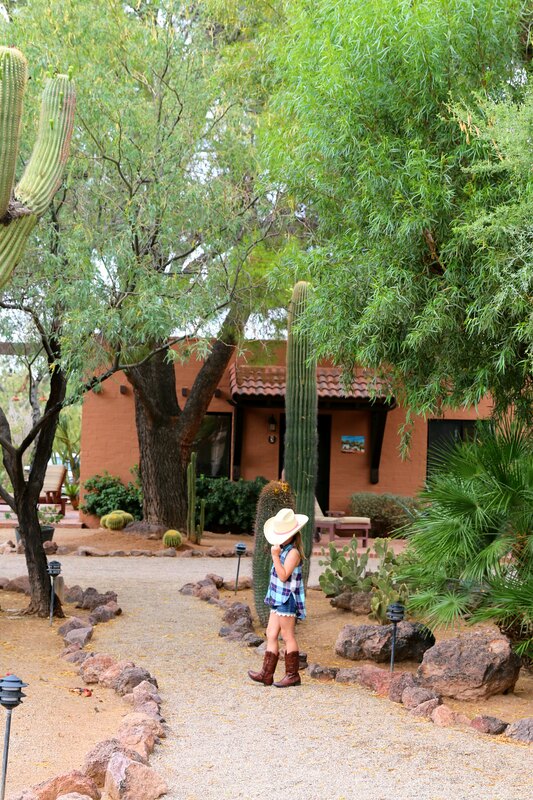 When I learned about White Stallion Dude Ranch, in Tucson Arizona, I knew we had to go, and I am so excited to share this review with you! Since summertime is our off season for traveling, we booked our trip for the day after Emmy got out of school. 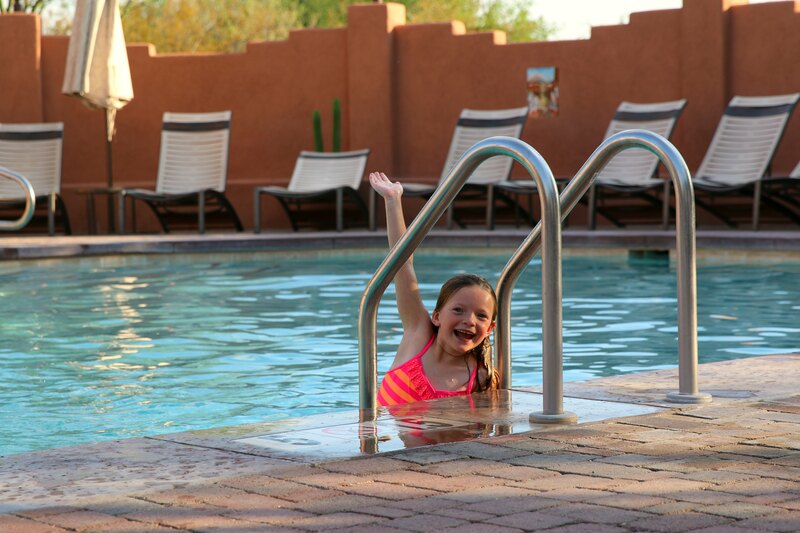 This also worked out well because it was before the monsoon and high heat of Arizona summers. 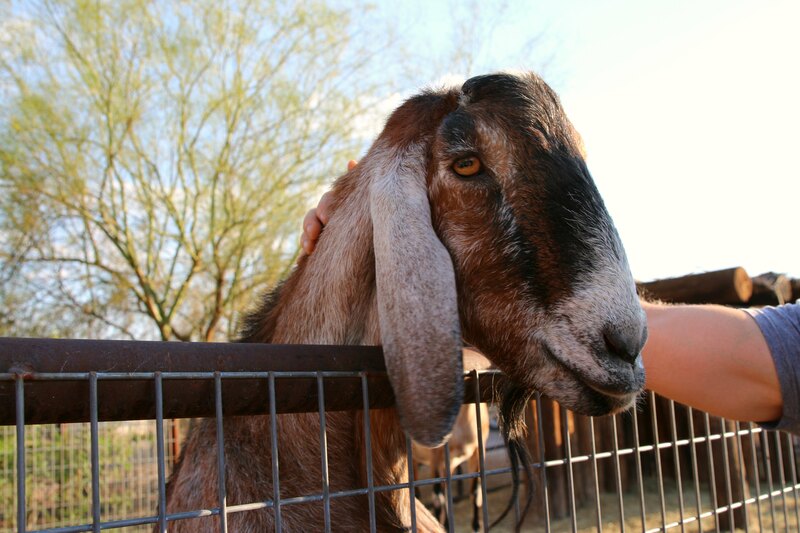 White Stallion Ranch is located in Tucson, which is about a six-hour drive for us from San Diego. It would have been an even quicker drive if we didn't often stop for snacks and bathroom breaks. I've decided it's just par for the course when road tripping with a six-year-old. 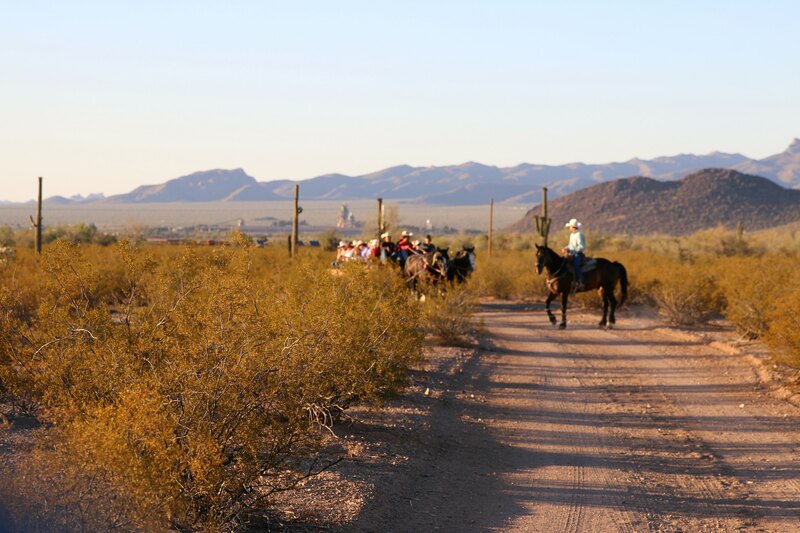 Once we arrived at the Ranch, it was like we were entering a scene from an old western movie. It was everything we had hoped for. 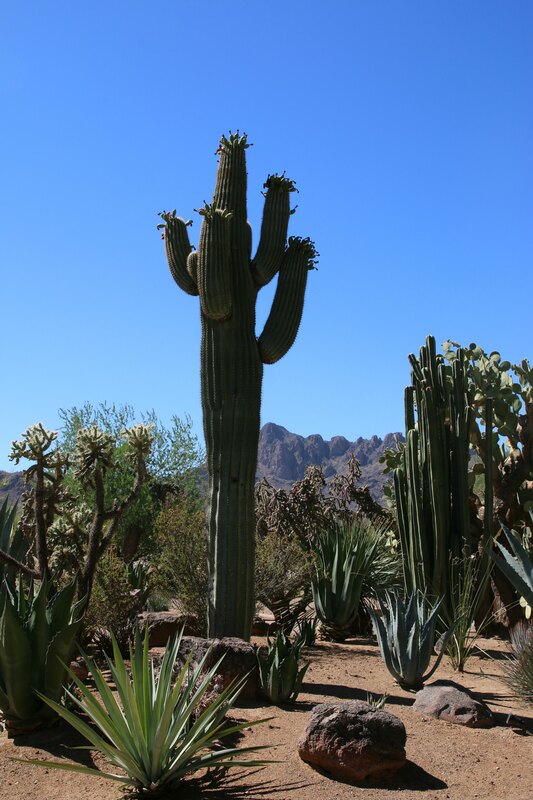 There were tall cactus, beautiful mountains, and the friendliest people on the planet! And because it was all inclusive, we didn't even have to worry about carrying around our wallets! Everything is included in your price except for private riding lessons, alcoholic drinks, sodas, and anything from the gift shop. We drove up to the office and checked in. 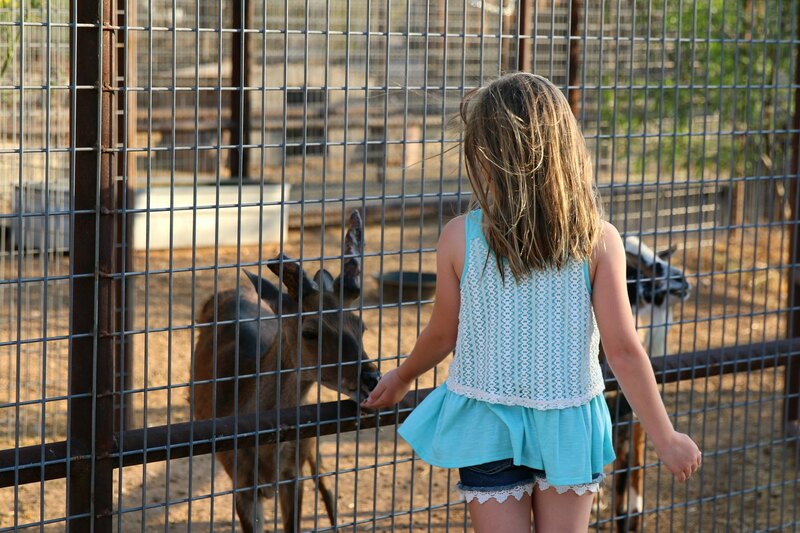 From there we were shown to our suite and around the ranch while given an introduction to how ranch life works. After that, we changed into our western wear and explored! 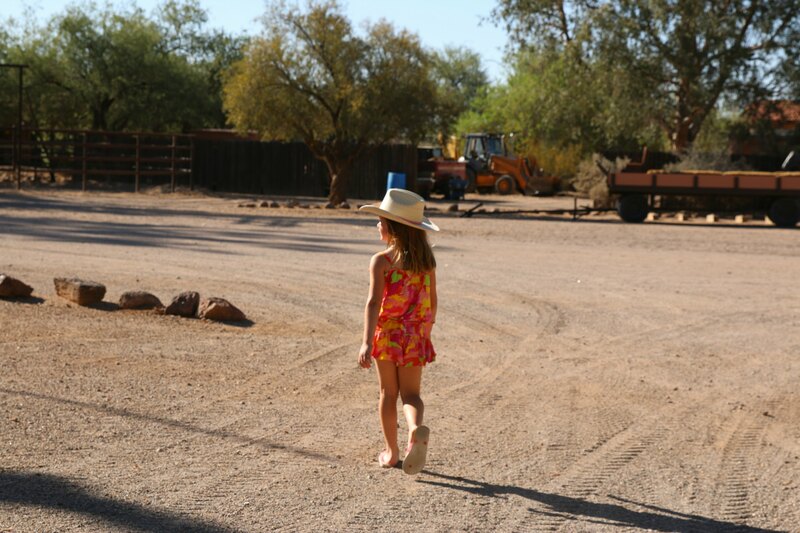 Emmy made multiple wardrobe changes a day, and almost all of them involved a cowgirl hat, even if the rest of the outfit was more “tropical vacation.” That is the beauty of staying here. There is no right or wrong way to do it. They welcome those looking for as much riding time and those that would prefer just to watch. 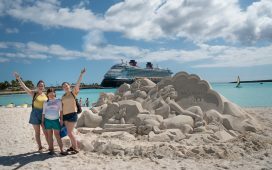 Either way, you will have a very memorable vacation with something for everyone! The food at the ranch is awesome! There are set dining times, and everyone eats together in the dining hall. Breakfast has all the traditional items on an a la carte basis and then extras buffet style. 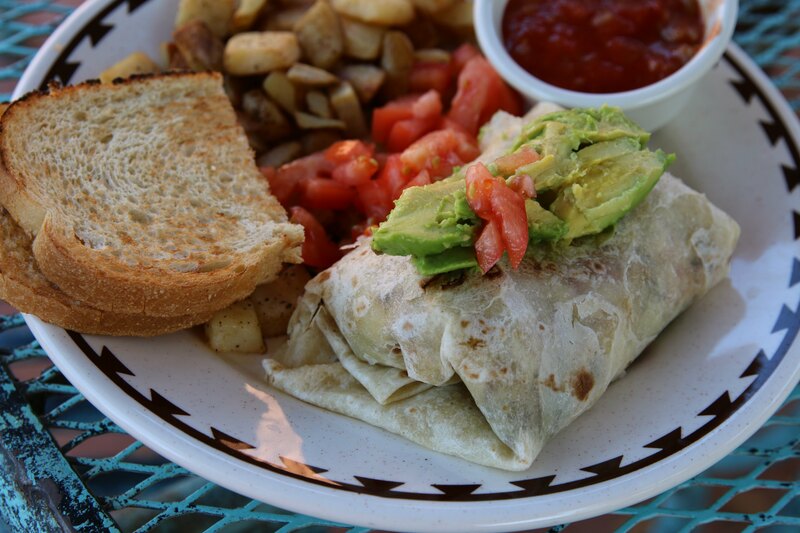 Every morning there is a special of the day, like a breakfast burrito, and then eggs, toast, pancakes and potatoes that you order by writing down what you would like and then a server takes it to the kitchen for them to prepare. The buffet has fruit, cereal, and bakery items available too. On certain days, they have breakfast out on the range. 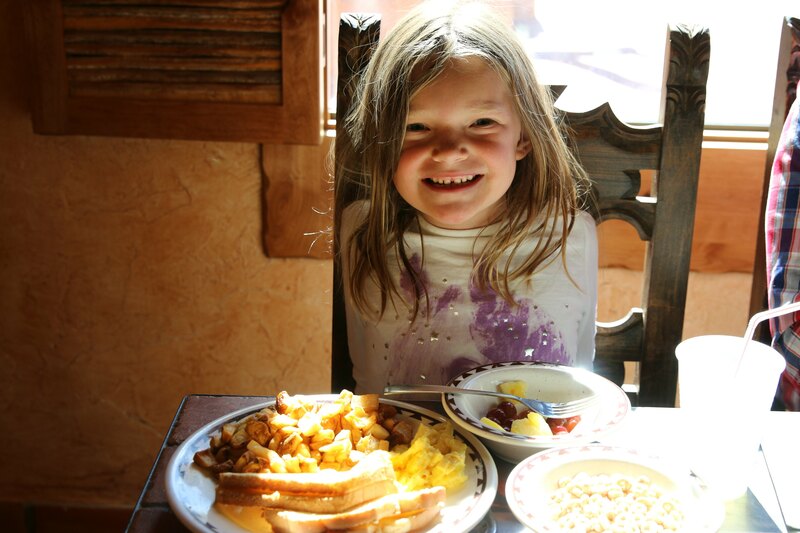 It is about a half hour ride to get to, and you get to enjoy a cowboy breakfast! 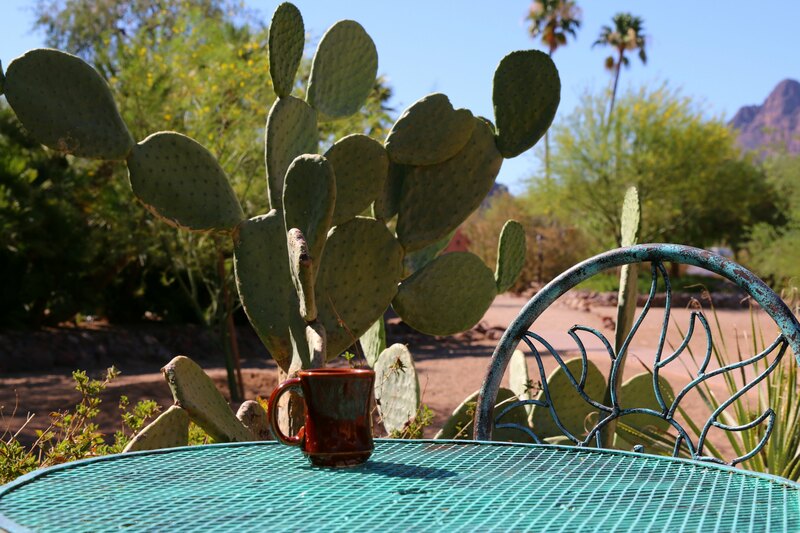 There is also hot coffee, tea (hot and cold), water, and lemonade available all day long. Bonus points that they offer almond milk too! Lunch and dinner are served buffet style and are themed. There was a Mexican dinner, a cowboy dinner, and more. Weather permitting, they also have a BBQ dinner outside. Dessert is also something that can't be missed! They serve decadent dishes made with old family recipes. Outside of regular meal times, they always have snacks available, and a social hour with appetizers. 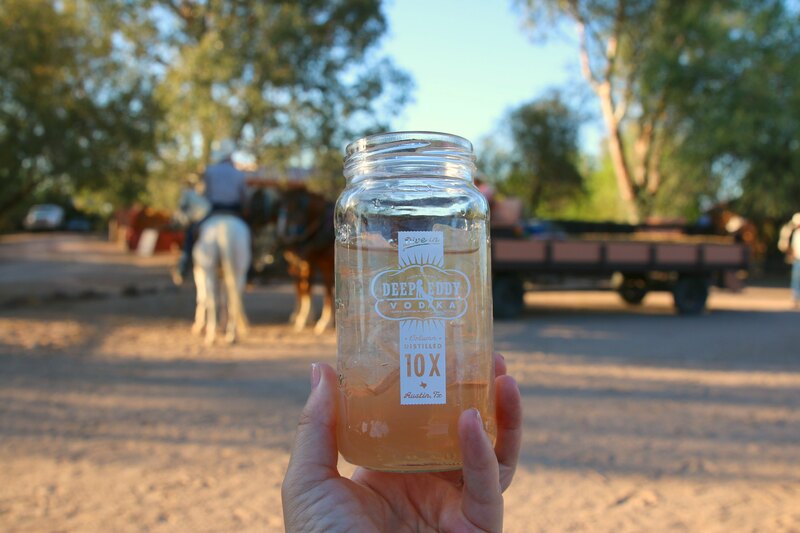 Our favorite evening was the family hay ride where they served prickly pear lemonade and two different alcoholic options, including a Monsoon Mule! While we rode around on the hay bails, we enjoyed cowboy caviar (aka black bean salsa) and an onion dip that was out of this world delicious! They also are very accommodating to alternative diets. 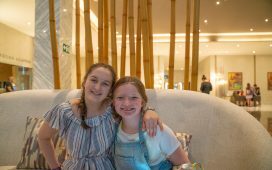 Since Maddie and I are vegan, they made sure to have ample options for us, and the chef spoke to us about our likes and dietary needs on our first day just to make sure that they were providing us a superior dining experience. They were just as helpful to others that were there, including those that are gluten free. 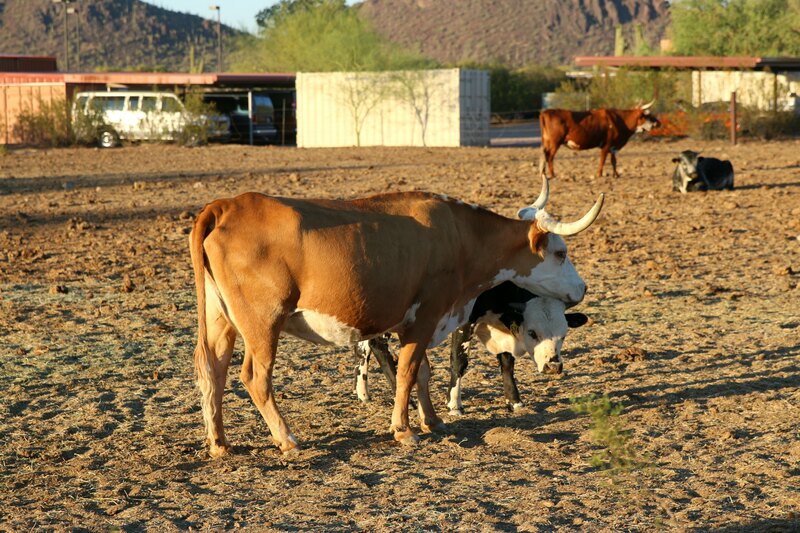 You will never be hungry when you are staying at the ranch. The ranch has around the clock activities too! 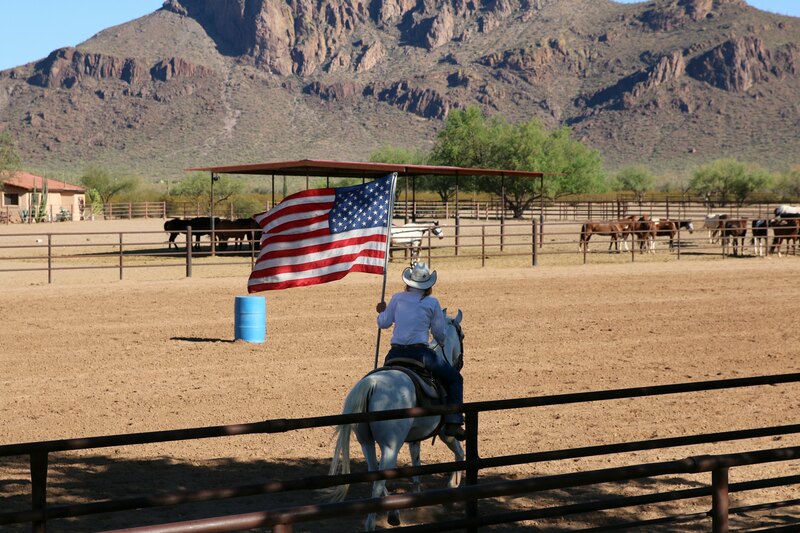 We enjoyed a ranch rodeo where the owners, The True Family, entertained us with the many events in a standard rodeo. Mr. True explained each event, and we left with so much more knowledge and respect for the sport. Other activities include a nightly experience. We were able to hear a well known local historian speak about the Native Americans and early settlers, see the planets and the moon when an astronomer was there, and much more! There was even country dancing being taught! The highlight, of course, was the horseback riding. On our first day, we were partnered with a horse for the week. One is carefully chosen for you, and they are yours for the entire time you are there. I imagined that we would be responsible for saddling them up and all that, and I was pleasantly surprised when each time I went to ride, they were there waiting for me. Not only were they waiting for me, but they even had ice cold water in a pouch to enjoy during the ride. This was nothing like the old school dude ranch experiences. This was pure luxury! There are six hours of riding time available each day, and the night before you sign up for your spot so that they can have your horse ready. During the summer, the rides are early in the morning and later in the afternoon to avoid the heat. Once a week they have a sunset ride, and that is my all time favorite one… so don't miss that one when you go. 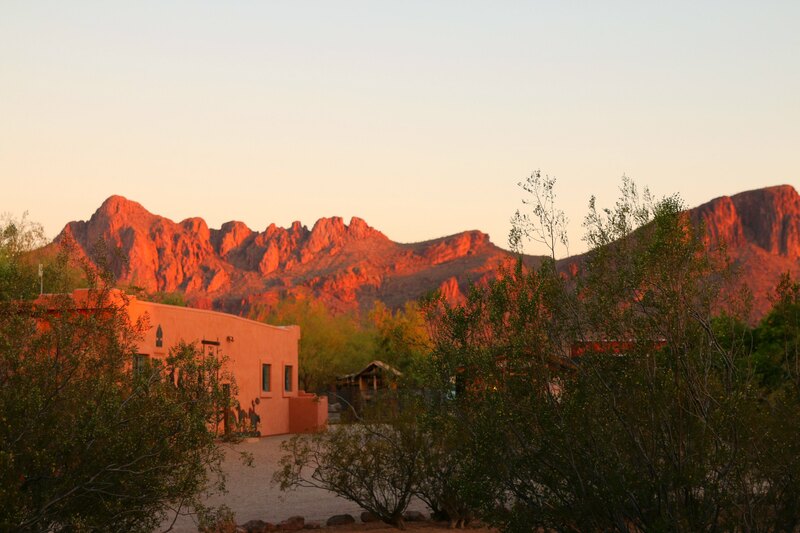 The colors that reflect off the mountains as the sun goes down is one one of the best sights on the planet! Children six and over are allowed to ride. Emmy had ridden before when we were in Hawaii earlier this year, but it was a lead ride, and this was her first time on her own. I was nervous, and I really shouldn't have been, because she did awesomely! There were other kids with us, and they all did great too. The horses are so well trained that they could probably do the whole thing with their eyes closed. They offer two different types of rides. A fast and a slow. The only difference is that on the fast rides there are parts where the horses are allowed to move faster. Emmy was too young for that, so we opted to have her take lessons each day where she could practice going faster in the arena. She LOVEDit! 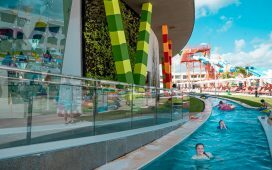 The lessons are one of the few things that are not included in the cost of your visit, but they are very reasonable, and they are paid directly to the Wrangler as a way for them to make some extra money. I highly recommend taking them. I've ridden many times in my life and didn't think I would benefit from the lessons, but I wish I had taken them as my skills were a bit rusty, and it would have been fun to learn some new tricks. Pete and the girls took them almost every day. 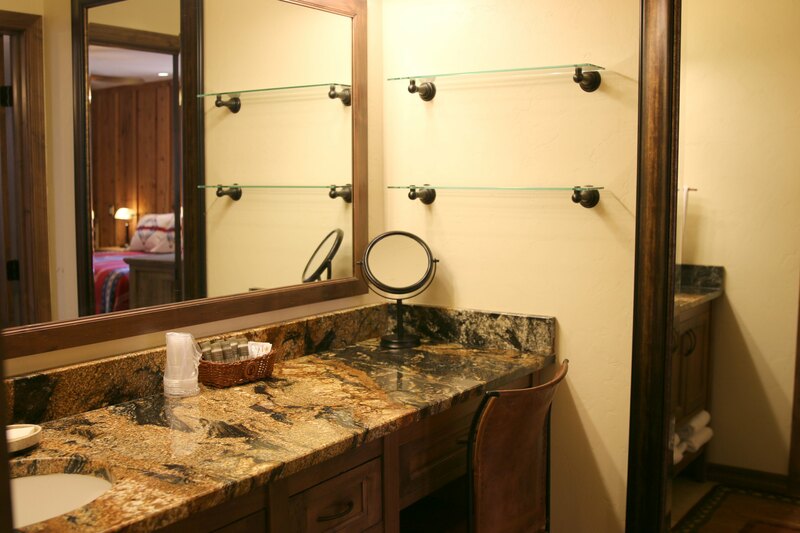 The Ranch also has many other ways to enrich your visit. We enjoyed the pool, petting zoo, and just relaxing! And even hanging out with the horses when they weren't off riding! The office has a huge bucket of horse treats, and the girls loved stopping by each day and handing them out to the horses. Everyone stays in a few rows of suites on the other side of the common area. 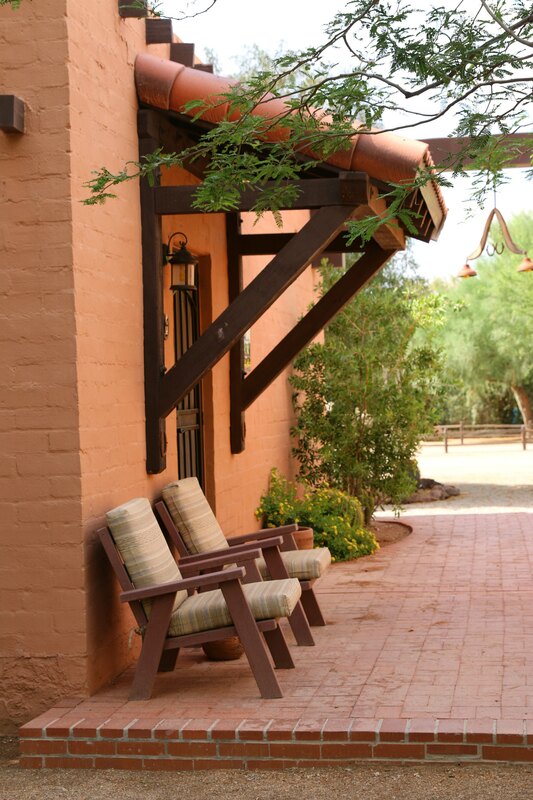 The chairs in front of the rooms were the perfect place to relax in the evening. We stayed in a family suite which consisted of two bedrooms and a bathroom. The girl's room had three twin beds, and the master bedroom had a large king bed. Noticeably absent from the rooms are a TV and phone. The girls were shocked to learn that there would not be a TV, but we assured them they wouldn't miss it, and they didn't. We found that we rarely even spent any time in the room unless we were sleeping. The ranch has a TV in the clubhouse for everyone to enjoy and there is a definite sense of community for all those staying there. It was a nice feeling being together with so many people from all over the world, and we never even ended up spending time watching the TV. Same for the phone….we never had a need to use one. If we needed anything, we simply went to the office and an actual person was there to help. It was wonderful. 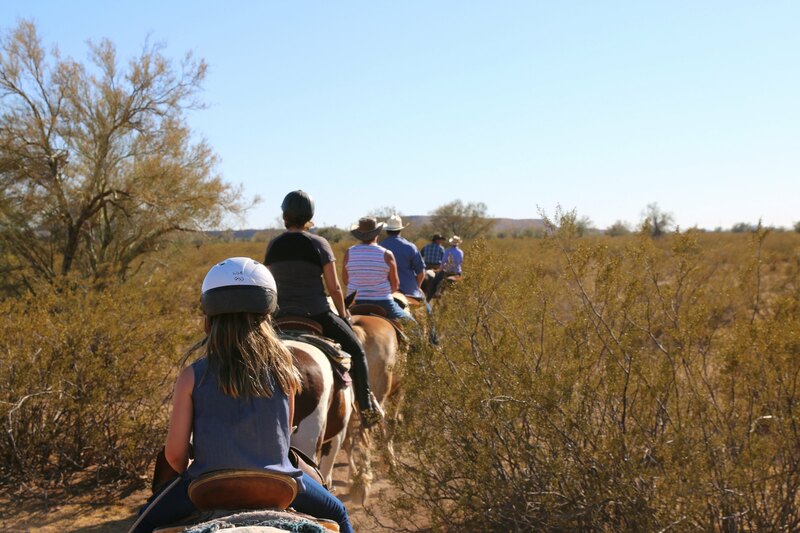 We had such a wonderful time at White Stallion Dude Ranch, and we are already planning on adding a dude ranch vacation to our travel schedule every year. It was that awesome! 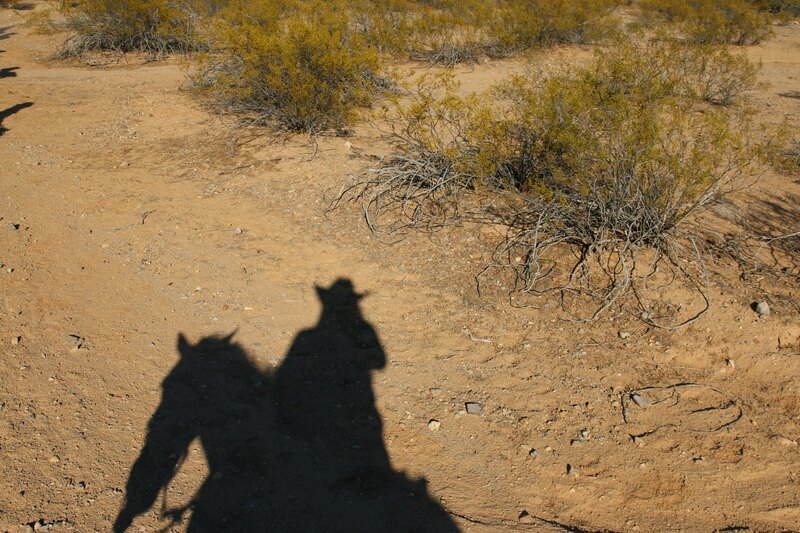 See our full White Stallion Dude Ranch adventure here. 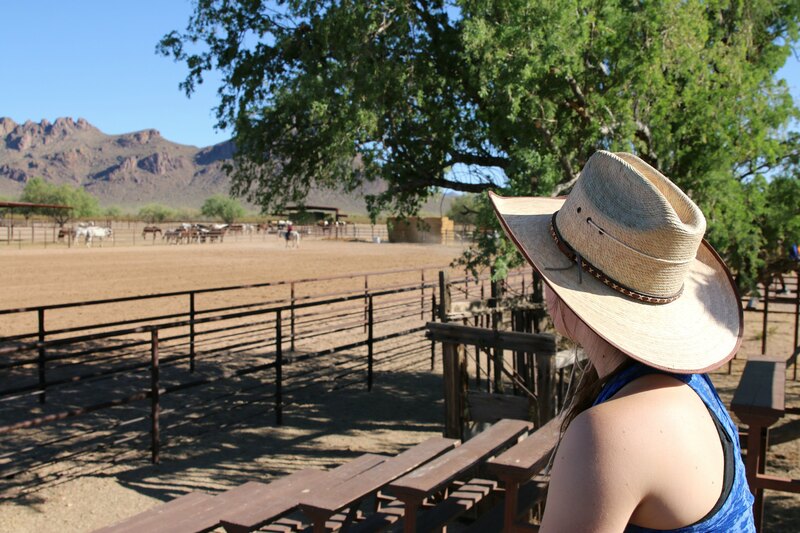 Have you ever been to a dude ranch? Thank you to the White Stallion Ranch for hosting our stay. All opinions, photographs, and videos of the property are our own. We’ve never been to a dude ranch before. It looks pretty cool. The food also looks pretty killer too. 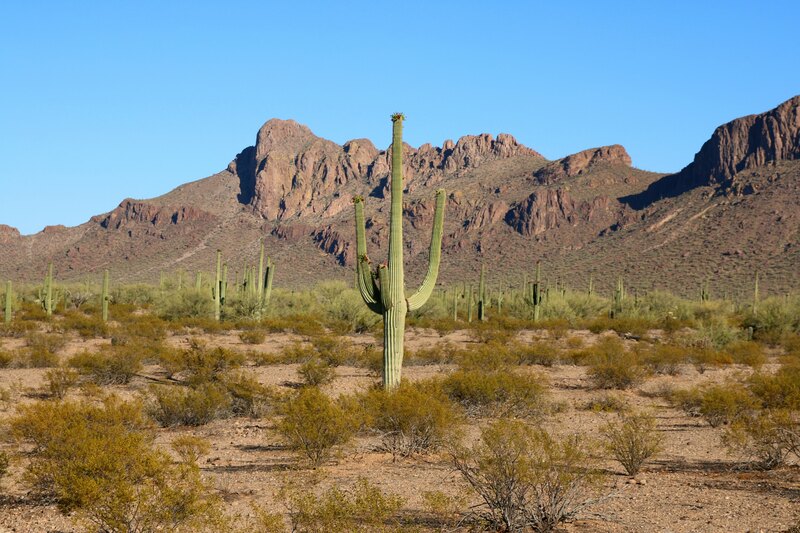 Would love to visit there should we ever be in Arizona. I would absolutely love to take a vacation with the family to White Stallion. My husband would love it even more. He’s ALL about the western stuff. 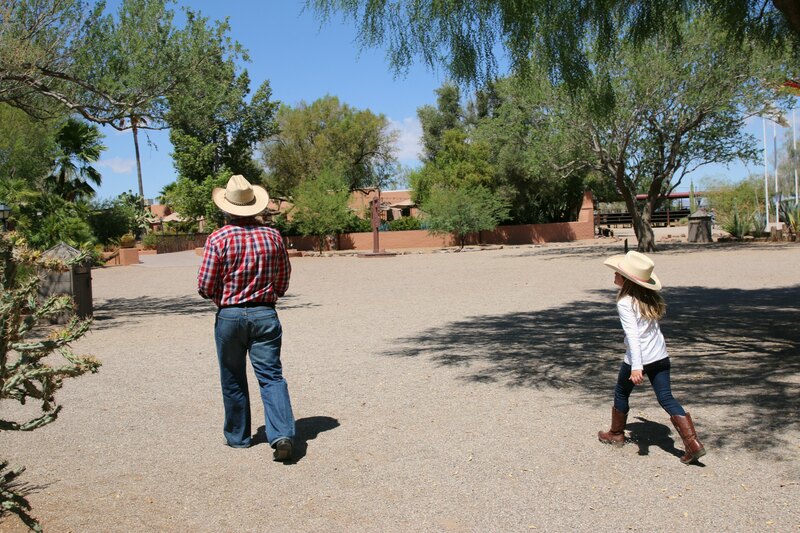 We did the dude ranch thing as kids and it was so much fun. I love being on a horse exploring the world around me. I’ve been talking about going to a dude ranch since I was a child. 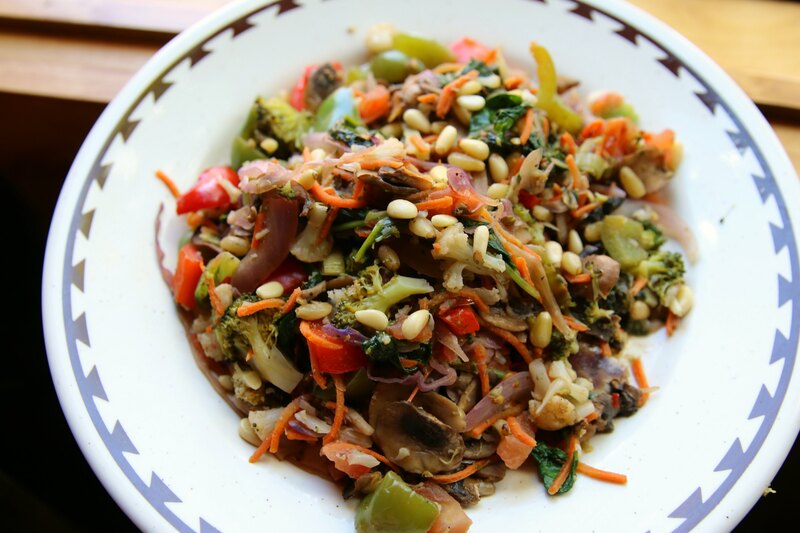 This looks incredible, Heather! 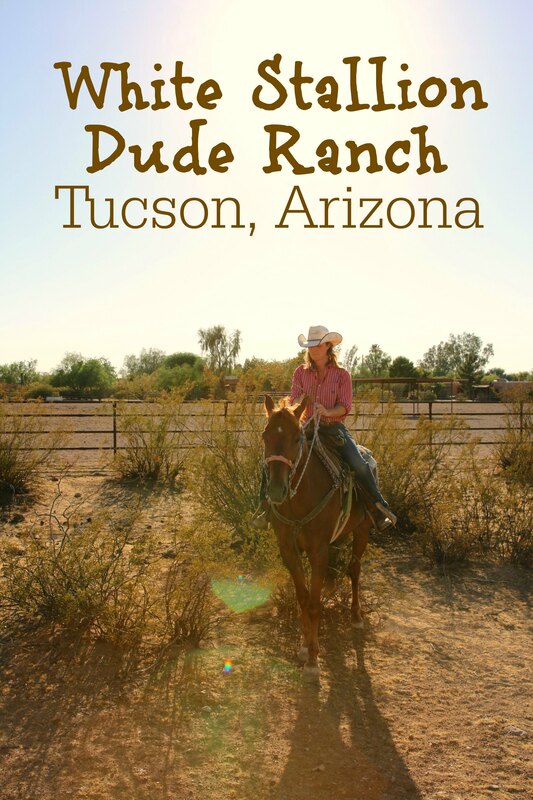 I have never been to a Dude Ranch but I have always wanted to go! They look like SO much fun! 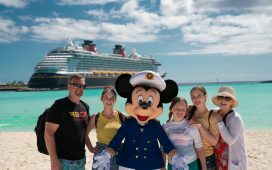 You family looks like they had such a great time! Never been to a dude ranch! Would love to, it looks like so much fun and lots to do. Hope I get the chance. This looks like a lovely time. Wow! I’m seriously going to look into the White Stallion Dude Ranch. My grandkids would love it and I could use a holiday without TV and phones. Everything sounds wonderful but you sold me when you mentioned they catered to your vegan diet. My husband and I are both vegan and find it hard sometimes to eat out. It looks absolutely beautiful there! Sounds like a fun time for the whole family. I’m not a fan of the heat, but the views there could maybe entice me down there to visit. I’ve spent some time in AZ (Sedonna and Flagstaff) and it is amazing. The dude ranch would just be icing on the cake. This looks like you all had an amazing time at the White Stallion Dude Ranch. I would love to go to this dude ranch some day. It looks and sounds like so much fun. The family suite is so amazing. I love the look and feel it has for sure. Thanks for sharing your experience. What a fun time. 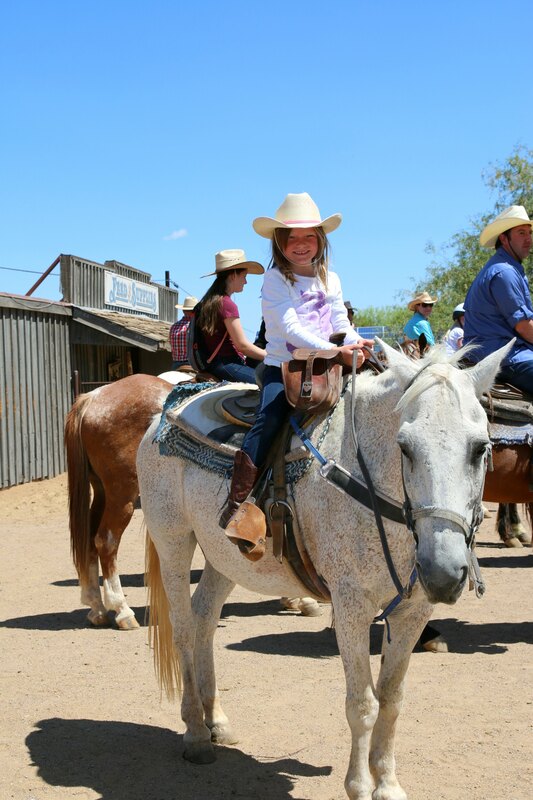 This looks like a wonderful family adventure to have … the dude ranch is really a great way to get out and experience something new! This ranch looks super fun! I love horse back riding and being in nature so this ranch is the perfect combination of both. I bet the kids were so excited to see “real” cactus. That seems like one of those things that because most only see them on tv and in books that it would be a huge deal. Kinda like when I went to South Carolina for the first time and saw a cotton field. SO fun! Your images alone, tell an incredible story! I’d love to take my family to experience something like this – and without reading your post – a ranch would have never crossed my mind. 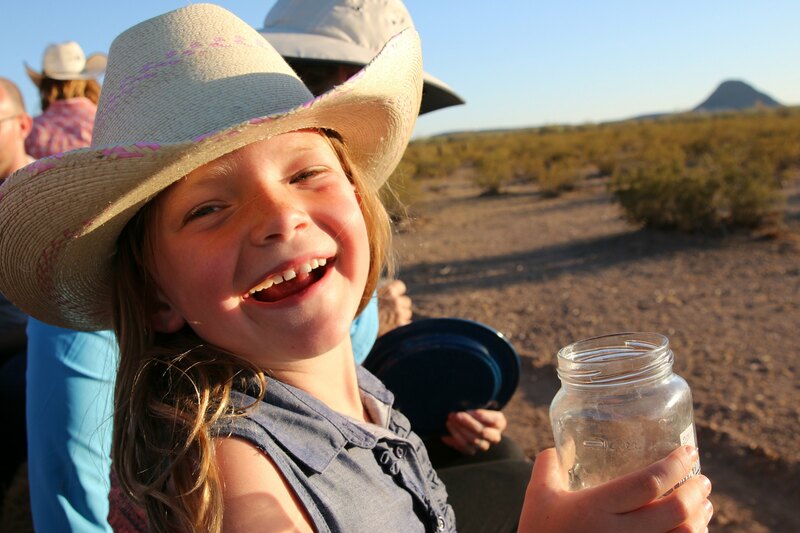 A dude ranch sounds like an amazing way to spend a vacation with the family. The food alone would draw me right in! I visit a dude ranch when I was in high school. I loved it. I may take my family to this one! Holy crap! The food, the cows, the horses, the goats! It’s all too much! I gotta get out there, soon! 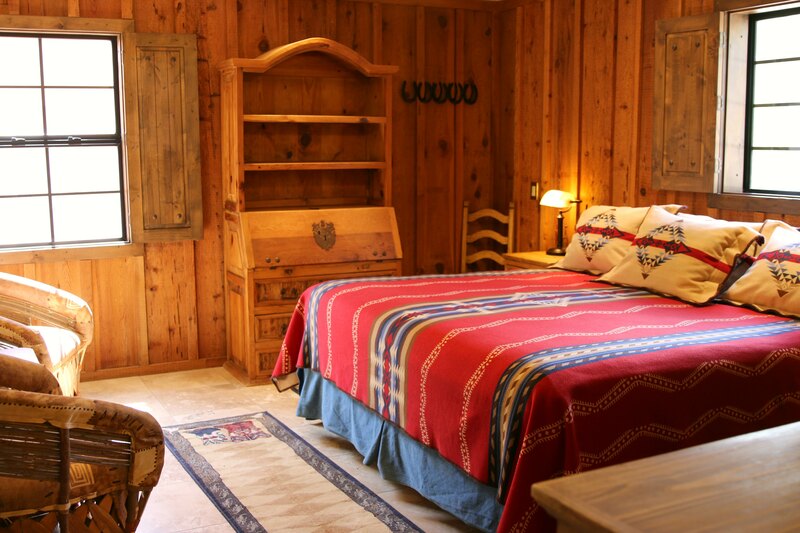 This ranch certainly seems to be the total package and I appreciate that it is all inclusive. 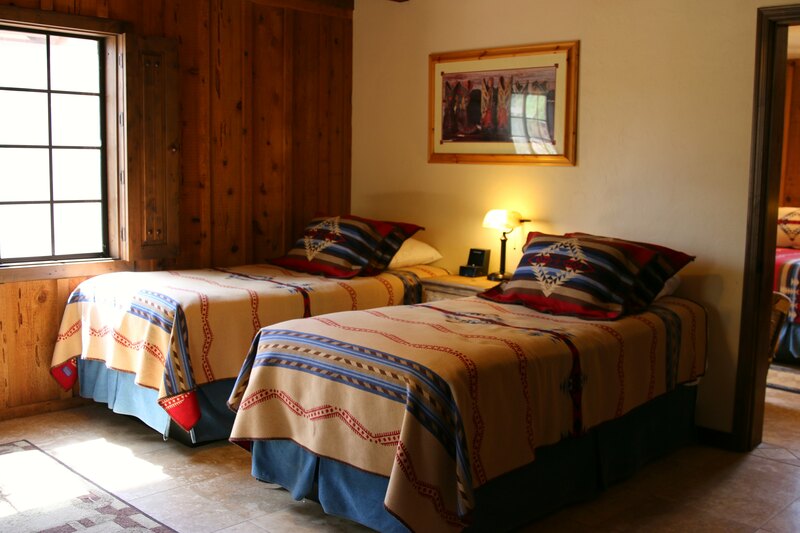 I especially love the southwestern themed room decor. The dude ranch looks and sounds amazing! I would love to go to one with my family one day! I’ve always wanted to go to a dude ranch and work/stay/play/camp. The only problem is I am slightly terrified of horses! 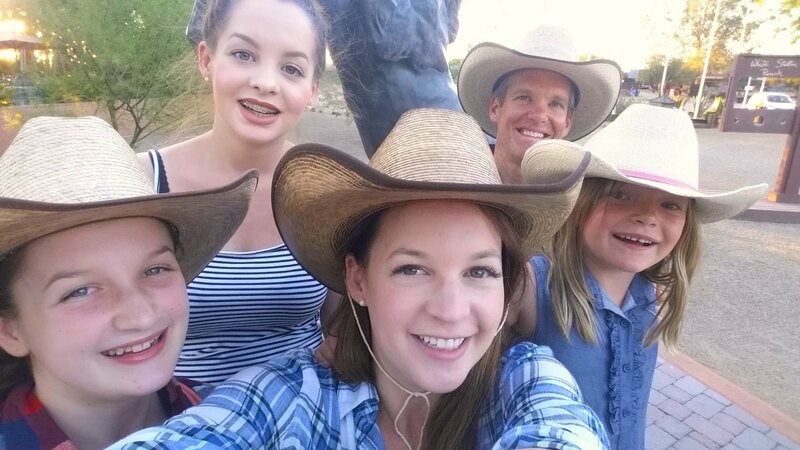 Never been to a dude ranch but it looks like you guys had a blast! I love horse back riding & the food looks yummy! Those are truly some amazing photos. Looks like you guys had so much fun. I’ve never been to a dude ranch, and I’m a little nervous around horses, but I may try it someday. This place is awesome as I can see in your pictures. I’ve never been to Arizona but we have friends over there so we might visit some time. I have actually never been to a dude ranch. But I need to! It looks like so much fun! I like your adventure, I never been in a dude ranch but sounds like a really exciting place to go to! Wow. You really have me wanting to do this now! I’m pinning so I don’t forget about it! This looks like so much fun! I love the scenery. We’ve only been to dude ranches in Montana. I need to look into this one! 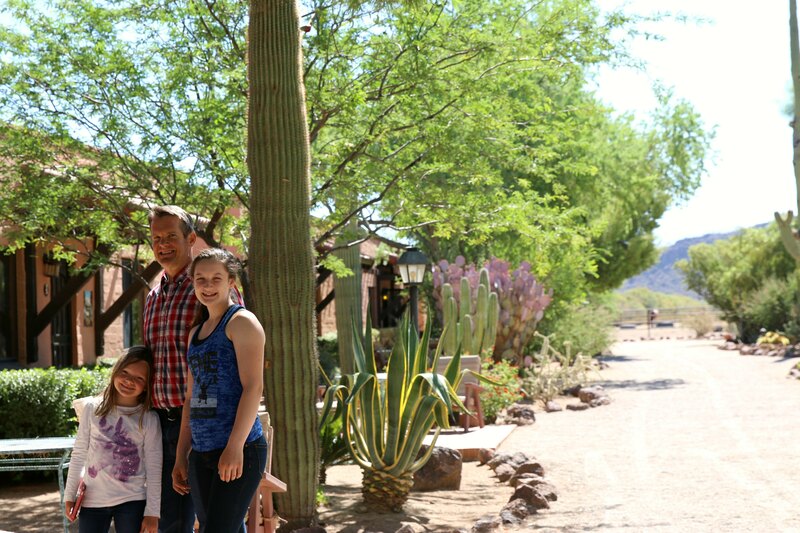 The White Stallion Ranch looks like an amazing family destination. I would love to go and spend a week there with my kids. I have never thought to go to a Dude Ranch for a vacation. It would be an amazing experience. I love your photos. That sounds like quite the experience. I’m sure it was a fun time! 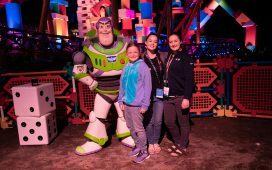 It looks like the whole family had an amazing time. It would be quite the experience. And it’s so beautiful. This is awesome. I have not been to a horse camp, but my family used to own all these horses but they’re all for racing so it’s kinda different. We don’t have much of these horse camps that are open for visits here in my country. This is one fun experience. My family is from Arizona and I’ve heard of this ranch! I’ve never gotten to go there but we had horses of our own and basically lived on a ranch so it was never a draw. Love it! This looks like an amazing place to stay for a vacation. The atmosphere, the food, the memories all sound like they would make one awesome adventure to remember. This ranch sounds amazing. I hope that I can take my boys horseback riding one day. My youngest is still a bit young. Looks AMAZING! Your whole family seemed to have a good time. Definitely fun for the whole family. We’ll have to make it there one day! I have always been fascinated by dude ranches and had no idea they were real! I guess I thought they were only a movie thing. They do look fun though! I like to go to a ranch for vacation. I remember your posts about your adventures, I am so tempted to go there! I’m usually not a fan of sweltering heat, but it sounds like I need to visit Tucson, Arizona someday. It looks so beautiful! 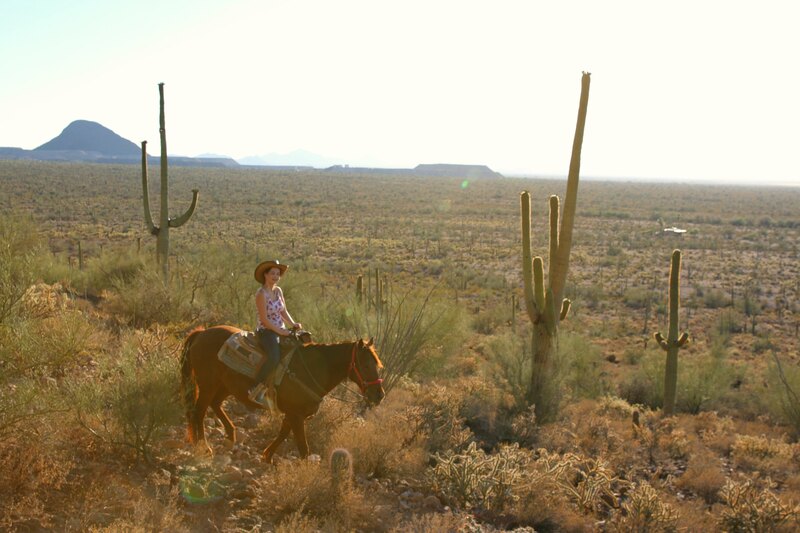 I’ve never been to Dude Ranch or any part of Arizona, but I would love to visit the place someday. Love exploring new places! This looks like it was so much fun. I have always wanted to go to a dude ranch. That’s such a great place to visit! Love your trips as a family! AMAZING! We live in the Philadelphia area and growing up we took a handful of family vacations to the White Stallion Ranch. Such fantastic memories! Now that I have a family of my own, I would love to take them one day to experience everything the White Stallion has to offer. I actually got choked up reading this post…brought back lots of wonderful memories. The True family is the best! Thanks for bringing back those memories!!! 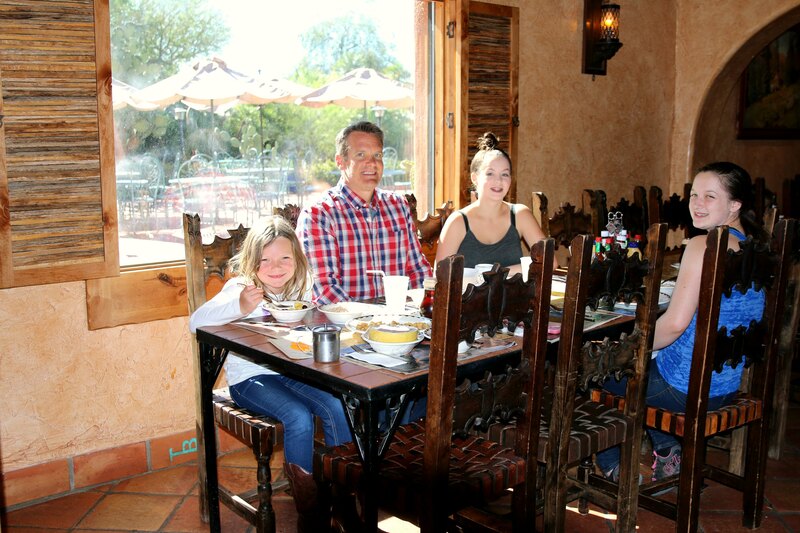 Seems like your family enjoyed the ranch as much as we did. 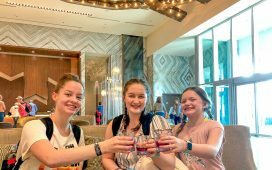 We absolutely loved our time there with the True Family! I love that you have such wonderful memories of your time there! My parents went here for many years & met up w/ the same group of friends each year. 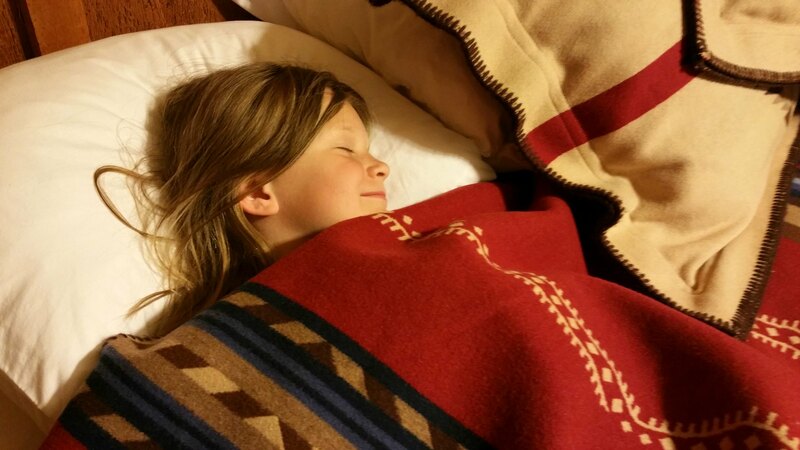 After my Dad passed away my Mom took my youngest daughter for a week. My daughter rides & works at a barn so this was heaven on earth for her. 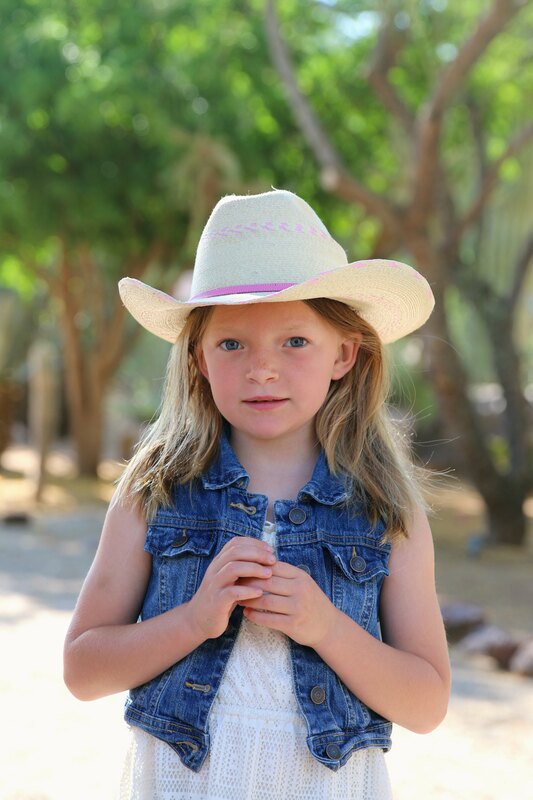 She went on the fast rides & did the barrel racing, plus hung out in the barn all week. Beautiful place & great memories for both my Mom & daughter. I’m so glad they enjoyed their time there. We sure did!